Whilst enjoying the refreshments at the finish of The Mercia Hill trial a fellow runner suggested that I should try this event a fortnight later. I entered as soon as I arrived home before I had time to have any second thoughts. The format of the event is simple, there is no set route, you can start at a time of your own choice within a 3 hour window and you don’t know exactly where the start is until you register on the morning of the race. 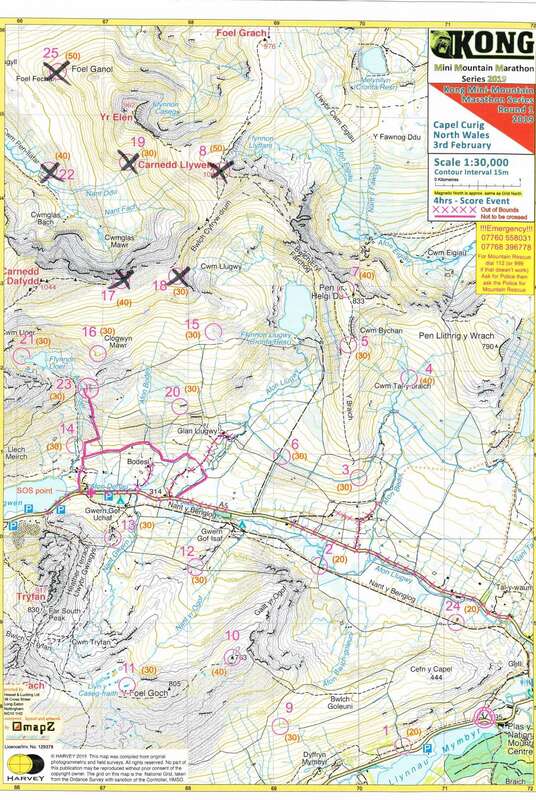 As you cross the start line you are handed a map showing 25 controls in an area of about 9km by 6km and you have 4 hours to visit as many as possible. The harder a control is to reach or navigate to the more points you get. Easy controls are worth 20 points whilst the tougher ones are worth 50 points. The final twist is that you are penalised for every minute late back to the finish, 1 point per minute for the first 5 minutes, 2 points per minute for the next 5 minutes etc up to 30 minutes where you lose all your points. During the week prior to the event it became apparent that we were going to be blessed with some full-on winter conditions and the day before it was announced that the race was definitely on, but 5 of the highest controls had been removed as conditions were too severe to allow the route setters to reach them. Arriving in Capel Curig at dawn for registration, the snowline could be seen at about 300m whilst the summits were hidden in cloud. A notice at registration informed us that due to the conditions it had taken a whole hour per control to set the route out, leaving us to wonder how many we could hope to find in a mere 4 hours! A 20 minute walk to the start just opposite Plas y Brenin could be covered in considerably less time at a run and served as good warm up. Crossing the start line a quick study of the map revealed that the event area covered the eastern end of the Glyderau and Carneddau straddling the Nant Ffrancon section of the A5. The first bit of route selection seemed pretty obvious, 2 low level controls on fast low level paths netted 50 points before heading up into the snow and cloud for 2 more controls either side of the summit of Foel Goch at 805m then straight off the north side of the ridge for a fast off trail run down a valley to reach another control on the in-bye fence which was followed westwards for another 30 pointer on the summit of Little Tryfan. With 6 controls ticked and over 2 hours left it was time to cross the A5 and head up onto the Carneddau, another 2 controls worth 30 points each took me up into Cwm Lloer where I made my first mistake. On paper it looked easy to head up a rocky spur and grab another 30 points before turning for the finish. In practice the snow was considerably deeper on this side of the valley and after 20 minutes of wading uphill through knee deep snow I was forced to retreat with no points and a very tight schedule to beat the clock at the finish. On the plus side the running looked fast and there were another 120 points to bag along the way, or so I thought! It is always a gamble moving fast when you can’t easily judge what lies under the snow and 8km out from the finish a trip over a hidden rock landed me headfirst in a very deep and very wet bog. To add insult to injury as I passed below the snowline it started to rain, slowed by the wet and cold I finally hit the finish line 11 minutes late and looking like a drowned rat. The final tally came to 20.72km of running or wallowing around in the snow, 1078m of ascent, 12 controls visited, 340 points earned, 25 points lost for the late finish, 41st out of 151 finishers and some really great food at the finish. These events are an excellent introduction to mountain marathons, you can choose to cover as much or as little ground as you fancy, enjoying a great atmosphere and good company, the entry fees are very reasonable and the food at the finish is free and plentiful. With 3 more events in the 2019 series I’ll certainly be back for more, if anyone else fancies a go there is every chance that the weather will be better for the next few rounds.